I confess I read Every Heart A Doorway on the strength of its asexual protagonist, Nancy, and I was not disappointed. But beyond Nancy, there is also a trans character (Kade), and Sumi, an Asian girl. I think Sumi may have been the only non-White character,* and it’s…not great that she essentially gets fridged. An additional diversity shoutout to the character of Eleanor, who, in running her school finds the word “crazy” problematic and bans it. I really loved this, considering the context, and I also really loved how some characters defiantly used it and reclaimed it anyway. 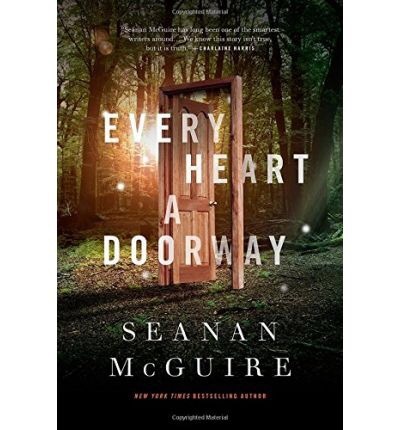 Every Heart A Doorway, by Seanan McGuire, is a murder mystery, and a coming of age story, and a portal fantasy all neatly wrapped in the same novella. It’s a minor miracle that the novella never feels overstuffed—in fact, I wanted more from it. I didn’t want it to end. Every Heart A Doorway follows Nancy, a girl who has been to and returned from the Halls of the Dead, and who must find a way to settle back into the mundanities of the normal, regular world again. Luckily for her, she’s not the only such stolen and returned child. There are enough such children that there is an entire boarding school devoted to their treatment and rehabilitation. ** Nancy’s parents pack her off, and so her story begins. Just as Nancy is finding her footing at her new school, students start turning up dead. And not just dead, but mutilated. Nancy understands that as the most recent addition to the school, and as a girl whose portal world has such a close connection with death, she is an easy and likely suspect. She knows clearing her own name means casting suspicion elsewhere, and that means unraveling the mystery at hand. McGuire is a deft writer. Since this is a novella, space is limited, and the cast of characters is surprisingly large for a novella. But the characters are quickly and deftly drawn. Most of them have excellent depth. The mystery itself has twists and turns and a decent red herring. The plot clipped along, quick but not rushed. I found myself more interested in the worldbuilding, though, than the mystery. There was something more compelling in the way the characters categorized the portal worlds—Wicked and Virtue, Nonsense and Logic—than the inevitable death of the next student, who I was sure was not going to be Nancy. I was particularly fond of the ending, which wraps things up so neatly emotionally, but quickly and quietly. It made me think. It made me mull things over. I want to talk about it with people, but I can’t here, because spoilers. As much as I am glad there was representation of a young ace woman and a young trans man, and as well-realized as a I think Nancy and Kade were, respectively, I wish their ace-ness and trans-ness had not been so…clinically written. I couldn’t help but contrast the way McGuire wrote about asexuality and gender identity with the way she wrote about the harms of patriarchy, and how in this world it so easily led to the capture of girls over boys. That section was nuanced and wry. Or compare to the embodiment of smart/pretty in Jack and Jill and how viciously that has gone awry, which is skillfully written throughout. The sections where Kade discusses his gender or where Nancy discusses her asexuality are blunt to the point of earnestness. Still, I am glad the characters were included. *I think this is the case? If I am misremembering, please let me know in the comments, and I will amend the review. **There are, as one character explains, actually two such schools: one school for kids who want to return to their portal worlds, and one school for kids who under no circumstances ever wish to see their portal worlds again. I found this detail particularly interesting. This entry was posted in 3 stars, Book Review, Musings and tagged every heart a doorway, seanan mcguire by brsanders. Bookmark the permalink.